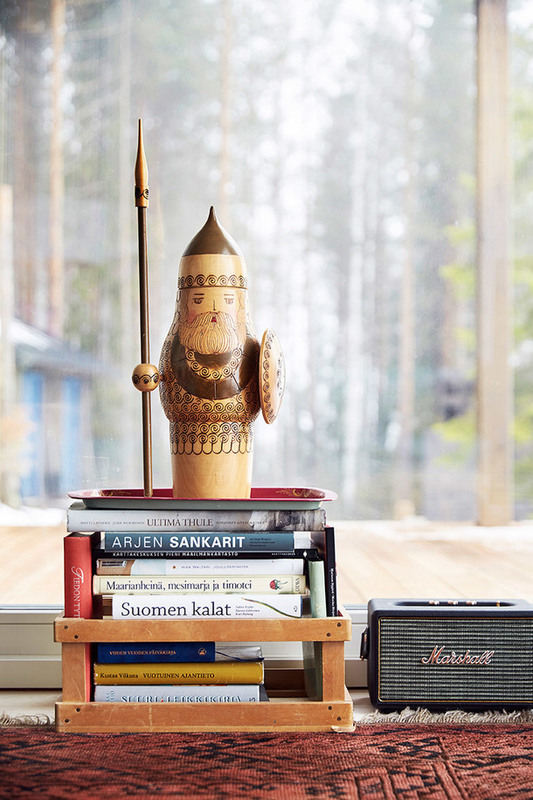 When the actor Ville Haapasalo not traveling the world, he spends time in a new house by the lake Saimaa in the Finnish town of Puumala. 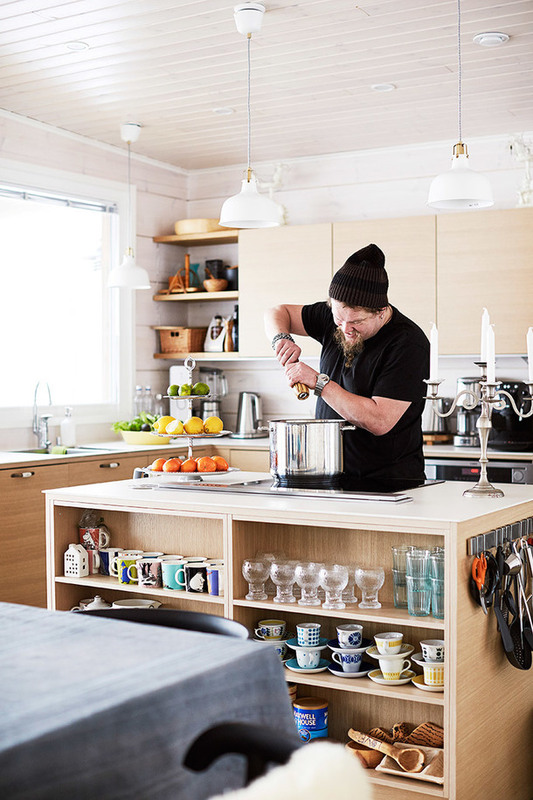 When he and his wife last summer finally decided to buy a cottage, Ville immediately went to the designers Honkarakenne with the house plan, which he drew on the box from under sweets. Ville, of course, understood that everything can go according to plan. The walls of the home area of ​​108 m², made of unshrinkable timber. Interestingly, the geothermal source is used for heating. "The most important thing is that I did not have to do anything myself. My memory like a goldfish: if I built and finished in a week, then I would have lost all interest in the project ", - says Ville. And builders made an excellent job without Ville. When he asked the carpenters, is there anything that he could make, they asked him to make coffee. "Because everyone should mind his own business", - nods Ville. Perfect plot for house found in Puumale, a stone's throw from the spot where Haapasalo as a child learned to swim. Quiet secluded place far enough away from neighbors. The house is built on the beach near the water. This arrangement was dictated by the terrain - steep rocky hillside. 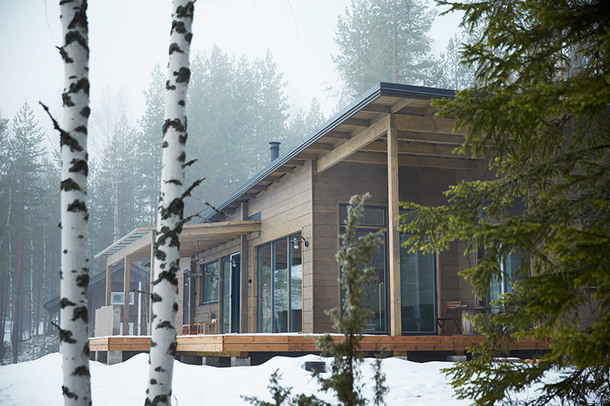 Because of this feature, it seems that a wide terrace house leads directly to the Saimaa lake - an amazing experience. From the outset, the main priority Haapasalo families were simplicity and comfort: The house has all the amenities of a city apartment. 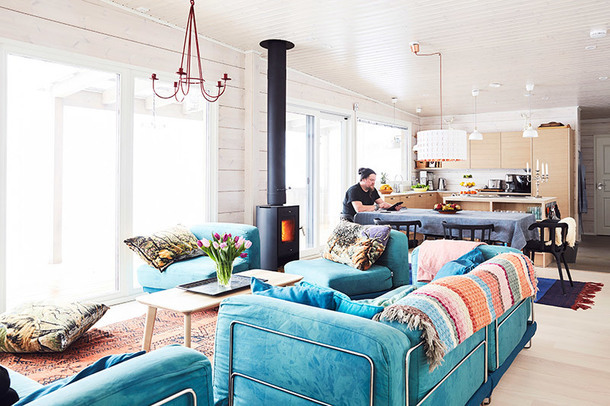 The large distance between the house and the cottage in Helsinki does not frighten them, as the house is designed for a long rest - here a day is not coming. Former site with a large garden, where the family spent the weekend demanded too much effort to maintain. This time it should have been easier. "I wanted a house on a cliff with all the bells and whistles. The house, which is ready to meet with me as soon as I crossed the threshold. I've had enough of camp life ", - says Wille. Cottage, in order to become a real home must be modest and functional. "I do not want to think about how to warm up or wash the dishes" - continues Ville. As a result, life away from civilization, has become quite tech and almost autonomous. Geothermal heating system maintains constant temperature in the house, and the water is from our own well, and the highest quality. Wastewater purification tested binding. For everything else, there are also Internet and security system. 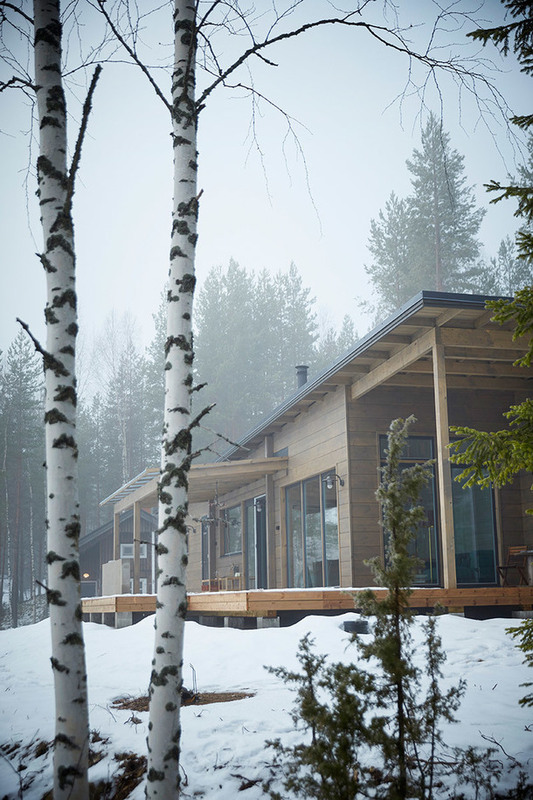 Additional heat gives furnace and electric sauna is switched by pressing a button. Initially, the Villa is not really like a sauna with electric heating, but as a good wood-fired sauna on the site has already been to the cottage was attached electrical. saunas design was for a villa very interesting occupation. On the plane, he painted two large windows - one opened obligatory view of the lake. 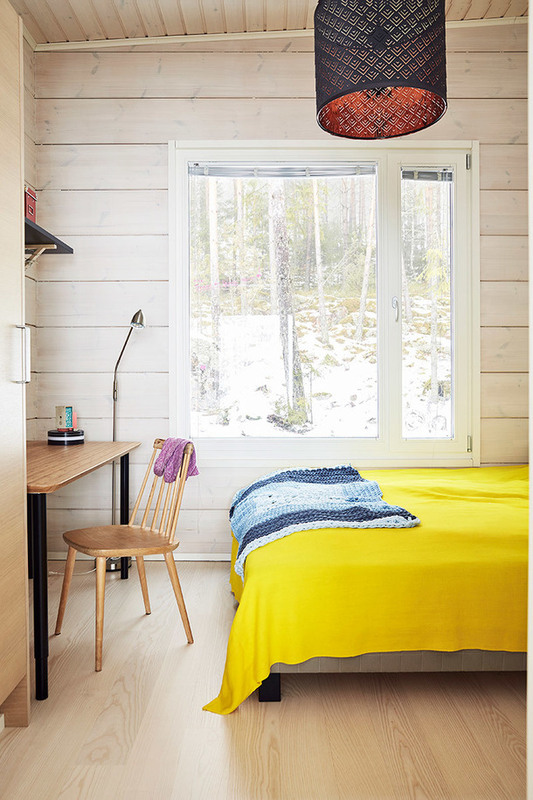 The color scheme for the sauna, he also chose himself: black and color of natural wood. 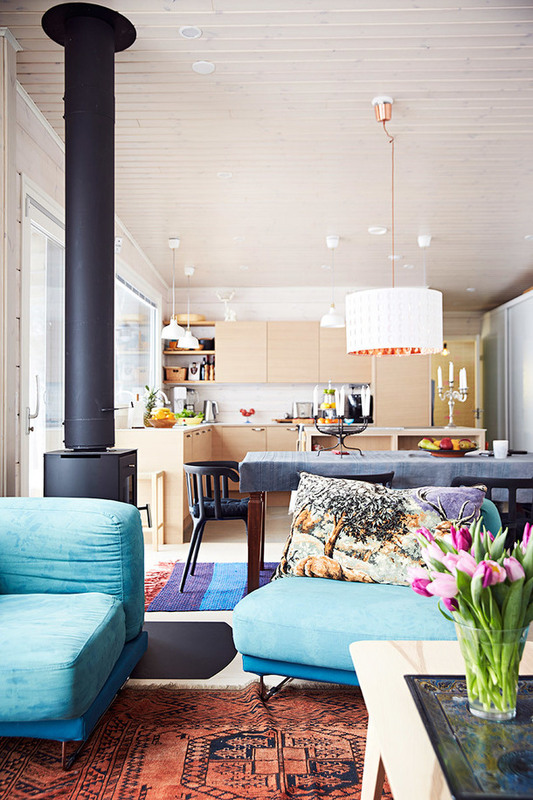 The interior of the cottage is also the creation of Haapasalo family. Shade of the walls - a light and neutral, against this background looks good brightly colored furnishings. 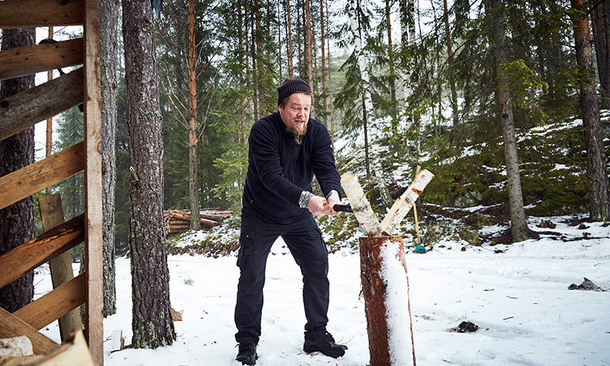 Despite the fact that Ville always liked darker tone, here he wanted more light, and most importantly, to the natural environment is easily visible even from the inside. The most important thing here - the large windows overlooking the lake. Ville says that she loves to wake up before dawn and watch the sun rise. Actor more than 200 days a year spent in traveling and free time from him a little. When he Puumale, then tries to take a break from everyday life: "Of course, I can not sit and do nothing, but what do I want to do at your own pace. When I want to, pinned wood or tossing stones, if the mood. It will be necessary - flooded sauna, and hungry - cook anything. " Physical activity - a good way to de-stress and unwind. At work, the Villa fulfills the desires of others, and here he wants to carry out their own, but at the same time as any of the host, the actor has big plans for the future: he wants to build a summer kitchen, pizza oven, covered floating wharf and walkways for swimming . And in addition to the usual sauna Ville dreams and a special underground sauna Cammy with a clay floor and a grass roof.